applicants throughout the United States and the Pacific Region. The Gates Millennium Scholarship is awarded to students who have attained a cumulative high school GPA of 3.3 on an unweighted 4.0 scale and have demonstrated leadership abilities through participation in community service, extracurricular, or other activities. The Gates Millennium Scholarship is a good-through-graduation scholarship to use at the college or university of the scholar's choice, and it may be renewed for graduate study in selected academic areas. Since Domclancy arrived at Yap Catholic High School on day the school opened its doors in 2011, he has averaged a 95% unweighted average, consistently earning him first honors as well as two coveted YCHS scholarships: the Father David Ciancimino, S.J. Scholarship (a full scholarship awarded to the top student of 12th grade) and the Father John Hagileiram, S.J. Scholarship (a full scholarship awarded to the top student of 11th grade). He has also accumulated several perfect attendance awards, missing only one day of school in the history of YCHS. He has captained the volleyball and basketball teams and served as the engineer and driver for the Yap State champion Robotics Team. Domclancy serves Mass at St. Francis Assisi Church, volunteers in his village of Gilman, visits elders and prays with patients at the hospital with the YCHS Christian Service team, participates in monthly clearings on the YCHS campus, recruits young people to attend monthly First Friday youth events in the local Catholic churches, and, most recently, led the YCHS Agape junior retreat. University, Chaminade University of Honolulu, the University of Hawaii at Hilo, and the University of Texas of the Permian Basin. FSMIS (April 30, 2014): The Federated States of Micronesia Postmaster General, Mrs. Ginger Porter Mida, together with other officials, held a postal stamps unveiling ceremony at the College of Micronesia-FSM (COM-FSM) main campus earlier today to commemorate the twentieth year anniversary of the college. The COM-FSM community gathered at the FSM-China Friendship Sport Center nestled at the college compound, along with Mr. Kasio Mida, Chairman of the Board of Regents, Mr. Churchill Edward, Board member, Dr. Joseph M Daisy, President of the college, Mr. Bethwel Henry, former FSM Postmaster General, and some friends and supporters of the college to witness the event. Pohnpei State Governor John Ehsa, United States Ambassador, Madam Doria Rosen, the People's Republic of China Ambassador, Mr. Zhang Lianyun and the FSM Deputy Secretary of Foreign Affairs, Mr. Samson Pretrick, attended the ceremony. Mr. Edward, member of the Board of Regents, giving a closing remarks during the ceremony. In his welcoming remarks, Dr. Daisy thanked FSM Postmaster General Mida for her thoughtfulness in according the college such recognition. He said the stamps were not just creative designs on canvass and stickers. The stamps symbolize achievements made and those to be realized by the college, according to Dr. Daisy. He stressed that the stamps stand for students who had gone through the college system, those currently attending and those to come. Postmaster Mida congratulated the college under the leadership of President Daisy for its success in maintaining accreditation and quality standards. She explained that commemorative stamps is accorded to a place or a person for recognition of exceptional value and achievements. She also said that commemorative stamps are collectible items of great value, encouraging the college members to purchase their stamps as they might run out after hitting the open market. Mr. Edward spoke on behalf of the Board of Regents, joining Dr. Daisy in thanking the dignitaries and those who took the time to honor the important event for the college by being at the ceremony. After the stamps were unveiled, Mrs. Mida explained that the items will be featured at the World Wide Philatelic Stamp show in Korea on July 11, broadening their exposure throughout the globe. Each stamp is worth 49 cents. For further inquiry, call FSM Postal Services at 320-2614/2615 or email fsmpio@mail.fm. Dept. Foreign Affairs (April 16 2014): On Tuesday, April 15, 2014 at 10:00am, H.E. President Emanuel Mori received the Letter of Credence of H.E. Roland Van Remoortele as the first Ambassador of the Kingdom of Belgium accredited to the Federated States of Micronesia in an official ceremony at the President’s Conference room in Palikir, Pohnpei. In attendance of the ceremony were Vice-President Alik L. Alik, Secretary Kensley Ikosia, Deputy Secretary Samson E. Pretrick and staff from the Office of the President and the Department of Foreign Affairs. During the ceremony, President Mori welcomed the Ambassador and his wife, Mrs. Sylvia Tay, to the FSM. He thanked him for visiting the FSM and congratulated him for his historic appointment as the first Ambassador of Belgium to be accredited to the Federated States of Micronesia, since establishment of Diplomatic relations in 1996. The President also indicated his desire to strengthen engagement and cooperation between the FSM and Belgium. As a founding member of the European Union, the President expressed appreciation for the EU’s development assistances provided to the FSM under its European Development Fund, which had supported FSM’s effort to implement renewable energy projects throughout the nation. President Mori took the opportunity to affirm Climate Change as a top priority for the FSM, which continues to be a major issue of concern to the FSM, as a small island developing state. Toward this end, he requested for Belgium and the European Union continuing support for the plight of small island states in the international debates. Other issues discussed, is the possibility of establishing an Honorary Consul of Belgium in the FSM as well as formal diplomatic representation of the FSM in Brussels, Belgium. Ambassador Van Remoortele also paid a courtesy call on Vice-President Alik L. Alik, Lt. Governor Marcello Peterson of Pohnpei State, Cabinet Members of the National Government and members of the Diplomatic Corps. The FSM Office of Environment and Emergency Management (OEEM), in collaboration with the Japan International Cooperative Agency (JICA), hosted the 3rd Joint Coordinating Committee (JCC) meeting of the Japanese Technical Cooperation Project for Promotion of Regional Initiative on Solid Waste Management in the Pacific Island Countries (J-PRISM), on February 27, 2014 at the OEEM Conference room from 8 am to 11 am. Invitations were sent to State Environmental Protection Agency (EPA) Directors, State Department of Transportation and Infrastructure and Public Works Directors, FSM Transportation, Communication and Infrastructure Secretary, FSM Department of Foreign Affairs, PMU Project Manager, SBOC Director, Japan Embassy staff, and Pohnpei Waste Management staff. The meeting enabled EPA/KIRMA and Public Works Directors to address key outputs and activities implemented in their states during the 3rd year of the J-PRISM program, and propose a way forward. The Government of Japan responded to eleven Pacific Island Countries (PIC) requests for its support of improved solid waste management in 2009. As a result, FSM is part of this regional technical cooperation project receiving technical assistance in the area of waste collection and disposal and landfill management. The overall goal of J-PRISM is to enhance sustainable management of solid waste in the Pacific region for the purpose of strengthening human and institutional capacity base through implementation of the Pacific Regional Solid Waste Management Strategy. In his opening remarks, JCC Chairman Mr. Andrew Yatilman welcomed the participants and noted J-PRISM's assistance to the FSM states in the area of solid waste management. Additionally, JICA Resident Representative Mr. Kaoru Iwasaki expressed his warmest regards to everyone and emphasized the importance of the J-PRISM's program in the area waste management. State EPA/KIRMA and Transportation and Infrastructure/Public Works Directors from Chuuk, Yap, Pohnpei, and Kosrae presented on the current progress of their outputs under the J-PRISM program. Outputs that were addressed pertained to Policy and Strategy, Waste Collection, Waste Disposal, Awareness, and Legislations. A discussion followed the Directors' presentations in which several topics were raised for the Directors to share and exchange their views. Topics such as leachate monitoring, sharing of landfill designs among states, and submission of monitoring action plans were raised during the discussion. Those representing the states included: Yap EPA Director Christina Fillmed and DPW&T Director Vincent Figir; Chuuk EPA Director Ishmael Mihkel, DPW Assistant Director Binasto Ruben; Pohnpei EPA Director Albert Roby, Pohnpei EPA Environment Specialist Charles Lohn, Kosrae EPA Director Robert Jackson, and DT&I/PW Director Weston Luckymis. Since 2011 through J-PRISM's technical assistance, the FSM states have developed solid waste management plans, improved waste collection and disposal systems, improved the management and operation of existing dumpsites, and participated in landfill and waste management techniques trainings in Japan. At the national level, FSM OEEM has finalized a National Solid Waste Management Strategy and is awaiting endorsement. The JCC meeting ended with the closing remarks by Mr. Shiro Amano, Chief Advisor of J-PRISM. As well as praising effort of concerned parties, he told the importance of the waste management, which is an endless issue, as long as people produce waste, to be tackled for the next generation. FSMR&D (April 11, 2014): A meeting of Pacific-ACP Trade and Fisheries Ministers is currently being held in Suva, Fiji to discuss the way forward on the Economic Partnership Agreement (EPA) for the PACP Group. After PNG’s announcement at the last Joint Technical Working Group in Brussels in October 2013 to withdraw itself from the negotiations on the comprehensive EPA, the EU suspended the negotiations on the justification that a comprehensive EPA could not be negotiated or concluded without PNG, who is the only Pacific ACP Member State who has signed and ratified the interim EPA (iEPA). In a March 2014 letter received from EC Trade Commissioner De Gucht on EU’s position on the way forward, the Trade Commissioner provided the PACP Group with possible options, which the PACP region could consider to move the negotiations forward. The purpose of this meeting is to have Trade and Fisheries Ministers deliberate over the best approach to move the negotiations forward. FSM’s interest in the negotiations is to secure global sourcing for HS products 0304/0305 (fresh, chilled, frozen fish fillets) and development assistance to support FSM and other PACPs with their trade and trade related needs. The meeting is being attended by FSM Ambassador to Fiji, Mr. Gerson Jackson, Assistant Secretary for Trade and Investment, Ms. Camille Movick-Inatio, and Trade Adviser, Mr. Jean Bertrand Azapmo. The ONPA announces the release of Audit Report No. 2014-05, Audit of ADB Grant Assistance for Weno Water Supply Well Remediation Project funded by Japan Fund for Poverty Reduction (JFPR) for fiscal years 2012 and 2013. The audit report is available for public viewing online at www.fsmopa.fm. Printed copies are available at the ONPA’s offices in Palikir, Pohnpei and on Weno, Chuuk. the project while the Chuuk Public Utility Corporation was the Implementing Agency. The project started in 2009 and was completed in July 2012. As a result, 28 water wells were made operational, delivering safe and secure water supply to the residents of Weno Island. opinion on the financials for the years ended September 30, 2012 and 2013.  Monitoring of reconciliations was not consistently performed. the MICR encoded checks routinely used for most payments processed through DFA. books of accounts of the FSM National Government. The concerned Departments generally agreed with all the findings and recommendations except for the finding and recommendation regarding the use of Manual Checks. The Acting Secretary of the Department of Finance & Administration disagreed with the recommendation that automating the printing of checks would minimize the likelihood for fraud and misappropriation of assets. The ONPA evaluated the response and is retaining the finding and recommendation about manual checks. FSMIS (April 10, 2014): During the recently concluded Third Special Session, the fourteen Members of the Eighteenth Congress of the Federated States of Micronesia unanimously authored and approved a resolution, expressing appreciation to Mr. Bethwel Henry, the first elected Speaker of the Congress of the Federated States of Micronesia, for his "dedication and public service to his country". The document refers to Mr. Henry as one "of the remaining 'Founding Fathers' of the Federated States of Micronesia, the group of Statesmen who forever changed the political landscape of Micronesia by establishing the foothold for the nations in the Micronesian archipelago to progress towards self-governance and sovereignty". Two nomination resolutions also met congressional approval; a nomination for Mr. Kalwin Kephas to represent the State of Kosrae on the FSM Social Security Administration Board of Directors and for Mr. W-One Williander of Toleisom Island in Chuuk to be the FSM Election Commissioner in Chuuk State. Mr. Kephas' resolution (C.R. 18-119) was introduced on January 22 and adopted on April 1. The confirmation resolution for Mr. Williander (C.R. 18-130) was introduced on January 31, during the Third Regular Session. Congress initially disapproved the nomination toward the end of the recently concluded 10-day special session, but subsequently reconsidered and confirmed it on March 31, two days before adjourning. FSMIS (April 8, 2014): In a November 13, 2013 letter to FSM Secretary of Justice Mrs. April Skilling, Senator David Johnston, Minister of Defence for the Australian Government, expressed his Government's appreciation for the participation of the Federated States of Micronesia in Australia's most recent International Fleet Review, celebrating the 100th anniversary of the Royal Navy's entry into Sydney Harbour. The event, which took place on October 4, 2013, was hailed a "significant event for the Australian Defence Force and the Australian nation". The FSS Micronesia represented the Nation's fleet at the maritime section of the FSM National Police, showcasing maneuver skills in such operation, acting among military vessels representing other participating countries. Senator Johnston wrote, "Australia values its relationship with the Federated States of Micronesia and I welcome our security cooperation through the Pacific Patrol Boat Program...I look forward to our continuing engagement on Pacific issues and Defence participation at the Maritime Security Cooperation Talks in 2014". The Maritime Security Cooperation Talks between Australia and the FSM were held on February 24 in Palikir. FSMIS (April 8, 2014): Planning for upcoming events, Federated States of Micronesia President Manny Mori and Vice President Alik L. Alik held a joint meeting involving the Department of Resources and Development (R&D) and the Office of Statistics, Budget and Economic Management, Overseas Development Assistance, and Compact Management (SBOC) on April 8 at the President's Conference Room. The Department of R&D is the Secretariat for the FSM State and National Leadership Conference (SNLC) while the Office of SBOC serves as the Secretariat for the 2023 Planning Committee, which is chaired by the President. Led by the President, the group tackled at the brainstorming stage preparatory discussions in stringing together the main issues to be addressed at the next convening of the SNLC. Tentatively, the SNLC is scheduled to fit into the first week of the 4th Regular Session of the Eighteenth FSM Congress during the second week of May, 2014. Some of the main concerns viewed at the meeting included the need to address the expected budgetary shortfall for all FSM governments in 2024 after funding from the United States under the amended Compact is terminated; the difficulties in gaining concrete federation-wide commitments in progressing needed tax reform legislations; insufficient progress in improving the foreign investment climate; formulation of a framework for the proposed Set Aside Fund (Investment Development Fund) to help with the state of FSM-wide economy; etc. This process involves the solicitation of inputs from the State Governments to be able to provide an agenda that reflects and integrates priorities from all parties for consideration of the SNLC. The SNLC Secretariat was asked to expedite communications to the State Governments regarding this process. At the latter part of the meeting, the President reviewed proposed timeline of activities to be taken up by the 2023 Planning Committee, namely the four Governors, the President and key Secretariat staff in the next couple of weeks. The upcoming outreach meetings throughout the Nation will focus mainly on concrete economic activities that the Private Sector would prefer to concentrate on within the priority areas of agriculture, fisheries, tourism and renewable energy. President Mori said the Government "must not dictate to the Private Sector" what investment or projects should be pursued. The President agreed to moving ahead on the proposed itinerary put forth by the Secretariat, with outreach meetings to start in Chuuk, Yap, Kosrae and conclude in Pohnpei before the convening of the SNLC in May. World Health Day, celebrated on April 7th every year, marks the founding of the World Health Organization in 1948 and is a unique opportunity to draw worldwide attention to a subject of major importance to global health. In 2014, World Health Day focuses on vector-borne diseases. Vector-borne diseases are illnesses caused by viruses and other germs that are transmitted by mosquitoes and other insects in human populations. Vectors are organisms that transmit viruses and parasites from one infected person (or animal) to another, causing serious diseases in human populations. Many of these vectors are bloodsucking insects which ingest disease-producing microorganisms (pathogens) during a blood meal from an infected host (human or animal) and later inject it into a new host during their subsequent blood meal. Mosquitoes are the best known disease vectors. With just one bite they can transmit diseases such as Malaria, Dengue, Leismaniasis, Lyme disease, Yellow fever, Japanese encephalitis, Chikungunya, Zika, Filariasis, etc. Other vectors include ticks, flies, fleas and bugs. Every year there are more than 1 billion cases and over 1 million deaths from vector-borne diseases globally. Vector-borne diseases account for 17% of the estimated global burden of all infectious diseases. These diseases are commonly found in tropical and sub-tropical regions and places where access to sanitation systems is problematic. Their distribution is determined by a complex dynamic of environmental and social factors. The most deadly vector-borne disease, Malaria, caused an estimated 627,000 deaths in 2012. Fortunately, the mosquito that carries this disease does not exist in FSM yet. However, the world's fastest growing vector-borne disease is Dengue, with a 30 times increase in disease incidences over the last 50 years. Globalization of travel and trade, and environmental challenges such as climate change are having a significant impact on disease transmission in recent years. Some diseases, such as dengue, Chikungunya and West Nile virus are emerging in countries where they were previously unknown. As of March 24, 2014 the Pacific Public Health Surveillance Network reported at least one on-going outbreak of vector-borne disease (dengue, Chikungunya or Zika) in eleven (11) Pacific Island Countries plus Queensland, Australia. There is currently an outbreak of Chikungunya in Yap State and as of March 20, 2014 the Yap Department of Health Services reported 1,711 cases from all the municipalities of the main island of Yap and three of the outer islands. Outbreaks of dengue have occurred in Yap in 2004, 2007 and 2012, and in Kosrae in 1996 and 2013. There were also two cases of dengue confirmed during a recent investigation of acute febrile illness in Chuuk in 2012. It is likely that the main vectors (Aedes species of mosquito) for dengue, Chikungunya and Zika also exist in Chuuk and Pohnpei, so there is potential for an outbreak of these diseases if we do not take the necessary measures or actions to protect ourselves and our families from these serious vector-borne diseases. Ø Get vaccinated again yellow fever and Japanese encephalitis, if you travel to countries where they are endemic. FSM Department of Health and Social Affairs and the World Health Organization, in partnership with States Department of Health Services and other States agencies, are raising public awareness on vector-borne diseases and other important public health issues beginning on April 7th and beyond. Though 2014 World Health Day is emphasizing the prevention and control of vector-borne diseases, the significance of this day to the overall and wellness of a person, a community and a population should be encouraged as a priority on this day and every day. FSMIS (April 4, 2014): Federated States of Micronesia President Manny Mori signed the Telecommunication Liberalization bill on April 3 at the President's Conference Room. Vice President Alik L. Alik, Secretary of Transportation, Communication and Infrastructure Mr. Francis Itimai, Secretary of Justice Madame April Dawn Skilling, Secretary of Finance and Administration Mr. Kensley Ikosia, Chief of Staff Mr. Leo Falcam Jr., Assistant Secretary of Communications Mr. Jolden Johnnyboy, Mr. Scott Garvey, legal advisor for Customs and Tax Administration, and other staff members of the Office of the President witnessed the signing event. Hailed a significant breakthrough and a turning-point, the liberalization bill signifies a refreshed momentum in the Nation's effort to boost communication capacities, which affects all-around development, most especially in tourism, education, health and information. After signing the bill, President Mori expressed gratitude to Congress and thanked the many individuals who played important roles throughout the process the past six months for the telecommunication objective the Government has been wrestling with for about seven years. The President also expressed appreciation for the involvement of the FSM Telecommunication Corporation, which helped producing "a product of team-work". President Mori said that the Telecom Liberalization bill, the Tax Reform proposals and the Airline Project being pursued by a taskforce are critical objectives for the Nation. Like the President, Vice President Alik underscored his appreciation for the encouraging results in the reforming of the telecommunication sector. He also added that the 2023 Planning Committee being chaired by the President is another corner-stone undertaking that the Administration is very keen on. In closing his statement, he invited everyone to stay on course in support of the remaining endeavors. Secretary Itimai called the occasion "a big moment" and also thanked Secretary Skilling, Mr. Scott Harvey and his Assistant Secretary, Mr. Johnnyboy for being on the front-line on the matter. He also congratulated the President and later told him that signing the bill makes his Directive of fiber optic connectivity to all the States inch closer to reality. Secretary Skilling said she appreciates the dedication from Mr. Aaron Warren, an attorney at the FSM Department of Justice, who was instrumental in the drafting of the bill. Wrapping up the exchange of comments, Chief of Staff Falcam said that while there is now a sense of relief with regards the signed liberalization bill, "the hard work has just begun". He said the bigger challenge remains in moving the new system into motion. In clear-cut tone, he summoned, "let's get to work". FSMIS (April 1, 2014): Federated States of Micronesia President Manny Mori indicated on March 26 his preference for Congress to focus on concluding its work on the Telecommunication Liberalization Bill and repealing the sunset clause in the Revenue Administration Act (RAA) during its Third Special Session. In the morning of March 31, about fourteen hours before the sunset clause deadline was to kick into effect nullifying the tax reform initiatives, Congress voted one in favor and three against changing the tax reform deadline through State Delegation vote, prompting some Members to quickly rally for a last attempt before Speaker Dohsis Halbert called for a lunch-break. Coming back to session at around 2:30pm after having a lunch meeting with President Mori and Vice President Alik at the Congress Hearing Room, Congress went through a reconsideration process and eventually chose to extend the sunset clause deadline to May 31, 2014. Regarding such decision, a Member expressed that the two-months extension is simply to allow additional time for Members to put into final terms their stance on the long-dragged tax regime change initiatives before the May regular session. The President signed Public Law 18-51, the amended sunset clause, the evening of March 31, less than 8 hours before the deadline. As for the Telecom Bill (as commonly known), the four State Delegations at Congress voted unanimously in favor of the bill after an amendment was made on the floor. The amendment had to do with altering certain provisions regarding the appointment of members for the regulatory authority that will govern and make regulations for the telecommunication sector for the Nation. As initially set, the FSM President has the sole authority to appoint and remove members of the authority. The floor amendment in its final form changes the specific section such that Congress would have the "advise and consent" power over the President's nomination. In other words, as in the case with the appointment of Cabinet and some board memberships, the Congress will have to confirm the President's appointments for members of the authority. All along, Congress took the review of the voluminous reform bill very slowly to carefully review the many components of the legislation that sought to bring changes to a highly technical sector that is critical to the socio-economic status of the Nation. President Mori welcomes the news on Congress' decision to open up the telecommunications sector with the passage of the liberalization bill. The bill has gone through rigorous review by different entities including the FSM Telecommunication Corporation and undergone oversight and public hearings by the Congressional Standing Committee on Transportation and Communication. Given President Mori's strong backing of the bill, it is anticipated that he will sign it into law. The opening up of the telecommunications market is seen as a necessary catalyst for the Nation to not only access needed Information Communication Technology support from the World Bank but also for the obvious need to attract probable telecommunications service providers in a competitive setting with the aim of improving user-based service access and costs. FSMIS (April 1, 2014): At around 1:30 in the afternoon of March 26, 2014, the Executive Steering Committee (ESC) for the FSM Tax Reform Project appeared in front of the Congressional Committee on Ways and Means at the Congress Committee Hearing Room in Palikir. The hearing started out with a brief courtesy call on Congress Speaker Dohsis Halbert who thanked the Committee for their interest in meeting with him and noted the endeavors undertaken in progressing the tax reform movement up to the present. Vice President Alik reciprocated complimentary remarks toward the Speaker and thanked him and Chairman Isaac Figir for the opportunity to appear before the Ways and Means Committee, availing time for both the ESC and the Committee to engage more on urgent matters relating to the over-10-year endeavor on reshaping the tax regime for the entire federation. Discussions focused primarily on the March 31st deadline under the "sunset clause" of the Revenue Administration Act (RAA). The ESC expressed its support of the request made by President Manny Mori in which he indicated to Congress his preference that the sunset clause be repealed from the act. However, the ESC also explained that it would settle for any decision that would prevent the triggering of the sunset clause and sustain the reform process. Apart from deadline extension concerns, some Committee Members voiced skepticism over the proposed tax regime and asked that clear state-based scenarios be provided in terms of how these measures will directly impact consumers. Assisted by staff of the tax reform program office, Vice President Alik assured the Committee that apart from targeting acceptable revenue generation measures, the proposed regime also seeks to underpin potentials for a more business-friendly climate for local entrepreneurs and foreign investors. At present, not only are the governments running tax systems with varying characteristics, but also there remain several impediments that continue to hamper robust development and economic gains over the years. A more sensitive point of discussion centered on the fact that Yap State and Pohnpei State, through their State Legislatures, have maintained their position against passing the Value Added Tax (VAT) legislation that the States of Chuuk and Kosrae have endorsed about a year ago. The ESC highlighted its interest in letting Chuuk and Kosrae implement the tax reform together with the FSM National Government. Through Chairman Figir, the Committee underscored caution against the tax reform implementation without having all the States endorsing the VAT as required by the sunset clause provision. This situation has created the stalemate for which some tax reform proponents, most notably the President himself, have called for affirmative action on removing the sunset clause from the RAA. Doing so will allow the incremental implementation of the reform measures by the entities that are ready while the other States continue assessing their respective position and possibly benefit from letting others test-run the proposed changes. The hearing ended with both parties expressing mutual appreciation for the opportunity in engaging one another in face-to-face exchange of views and sharing of information. 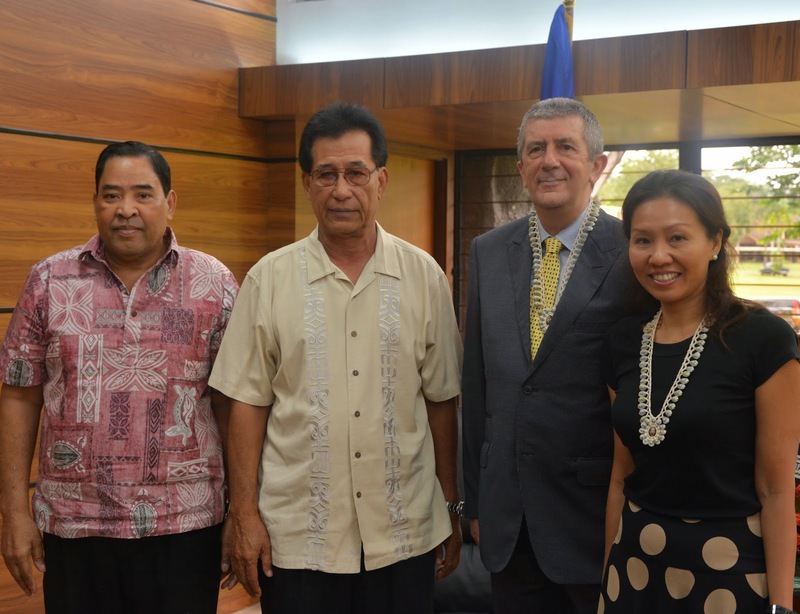 FSMIS (April 1, 2014): In the morning of March 27, Federated States of Micronesia President Manny Mori met with Governor John Ehsa, Pohnpei State; Governor Sebastian Anefal, Yap State; Governor Johnson Elimo, Chuuk State; and Governor Lyndon Jackson, Kosrae State in Palikir. The Governors were in Pohnpei primarily for the meeting of the Tax Reform Taskforce Steering Committee held the day before. President Mori, accompanied by Vice President Alik L. Alik, welcomed the Governors to Palikir and discussed a few matters relating to the activities of the 2023 Planning Committee along with its Secretariat. With assistance from Chief of Staff Leo Falcam Jr., President Mori provided a review of the completed round of community outreach meetings throughout the Nation as part of the mandate that the 2023 Planning Committee is currently undertaking. The President stressed that as the 2023 Planning Committee moves further along its timeline of action, more emphasis will be placed on engaging the Private Sector actively in identifying specific development targets and activities within the priority sectors of tourism, fisheries, agriculture and renewable energy to have a focused view on well-defined development agenda. In furthering decisions of the 2011 FSM Economic Summit, the Leaders also emphasized the critical importance for the Governments, the Private Sector and relevant stakeholders to deepen efforts in identifying and removing impediments to growth and nurture an business-friendly climate to boost stability. The President made mention of the need for the 2023 Planning Committee to review its timeline of actions and determine a more enabling funding level with the help of the Governors who comprise the Committee. The Leaders also touched upon other pressing topics such as the Compact Trust Fund investment and the backlogging of Compact infrastructure development projects already identified by the State Governments through their respective infrastructure plans. The Leaders agreed to jointly address infrastructure development project concerns through a sanctioned body, in addition to normal procedures pertaining to the amended Compact. Witnessing the Leaders discussions were members of the Unified Revenue Administration Board of Directors, a few staff of the Tax Reform Program Office. For further information on the meeting, contact the FSM Information Office at 320-2548 or email fsmpio@mail.fm.